Kentucky was well-represented in the December issue of Bee Culture Magazine. 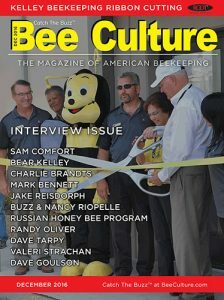 The Kelley Beekeeping Company’s ribbon cutting was featured in the business section of the magazine and made the magazine’s front cover. Our State Apiarist, Tammy Horn Potter, was also interviewed and featured in an article about her literary contributions to beekeeping, her work as the Kentucky State Apiarist, and the work she is doing to create a Kentucky Queen Breeder’s Association. Both articles can be read online. Congratulations to Tammy and the Kelley Beekeeping Company for the national recognition. Thanks promoting and supporting beekeeping and beekeepers in Kentucky.